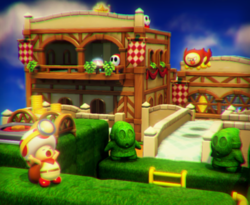 Shy Guy Heights is the 6th course of Episode 1 in Captain Toad: Treasure Tracker. This level takes place in two grassy areas, consisting of a hedge maze and a small town. Captain Toad starts in the bottom-left corner of the level, and needs to reach the Power Star far on the other side. The first half of the course is a large hedge-maze, where he can find a Spinwheel. Using it turns the bridge leading to the second half of the level. He can also use this bridge to reach a platform containing a Super Mushroom and some coins. The second half of the level is a little town that contains many Shy Guys, which need to be avoided while climbing up the left building to get the Power Star. Super Gem 1: In the maze section of the level. The player needs to drop onto it from above. Super Gem 2: Given to the player by Blue Toad, who can be accessed by breaking the Rock Blocks in front of him with a Super Pickax. Super Gem 3: Located on the back-side of the second floor of the building with the Star. A hidden 8-bit Luigi can be seen on the barrels behind Captain Toad during the "Course Clear!" animation. It was removed from the Switch and 3DS versions of the game.